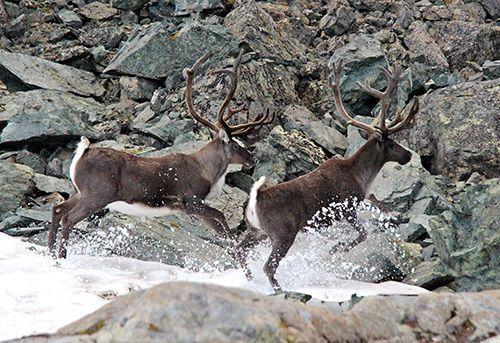 Wild Caribou Dash Across A Rocky Stream. 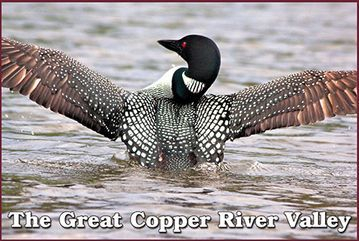 The main place you'll probably see wildlife like moose and caribou, or foxes, is from Copper Valley highways. Be careful while driving. Although foxes, wolves and coyotes know enough to rapidly cross the highway to avoid an oncoming vehicle, some of the other wildlife have no conception of oncoming traffic. Prey animals – like caribou and moose – don't have the innate ability to anticipate the trajectory of an oncoming car or motor home, and get out of the way. Instead, they blindly lumber around on the highway, sometimes walking, in large groups, straight toward you. This is no small problem, as hitting a moose is about as dangerous as running into a post or a small car at 60 mph. The Alaska Department of Fish Game officially calls much of the Copper Valley "Game Management Unit 13." It's a very important wildlife area, due to its huge size, and its large number of migratory species that come and go through the region. 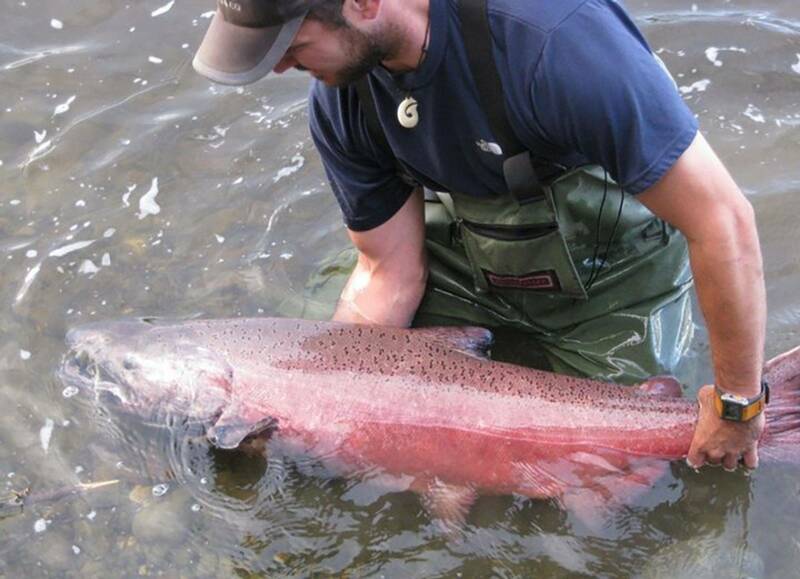 The most obvious migratory animals are Copper River salmon, which show up around the beginning of June, and brought life and sustenance to the Ahtna people for centuries. But there are other migrators: Robins, for example. And seagulls, pipers and trumpeter swans. 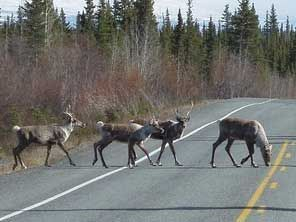 The huge Nelchina caribou herd travels back and forth through the region, on well-established trails, and time schedules. And, there are moose, wolverines, foxes, wolves and bears roaming the region, too. Compared to Denali National Park, which is well-known for its wildlife viewing, there is a denser population in the Copper Valley. But that doesn't mean these animals are easy to see. The valley is full of hills and gullies, and thick, impenetrable stands of black spruce.